I remember last year's Earth Hour experience. As much as Aileen and I wanted to support the cause, we were on the road in Makati. The only lights we had on were the headlights and I was worried how we could possibly turn them off. We couldn't park cause the vicinity wasn't a safe at night, much more in the dark. Fast forward to 2010. We didn't have any plans to go out for the evening and so we just stayed at home. We got to prepare for Earth Hour this year. We were hurrying our dinner preparations by 8pm cause we didn't want to eat in the dark. So by the time Earth Hour started at 8:30pm, we turned all our lights off (5 minutes after just to clean up the dining table) and just spent it in our front yard. We placed 2 monoblock chairs and sat there telling stories to each other. It's a good thing that the moonlit sky shed us some light. We totally turned off all lights and didn't even light any candles. In addition to turning off our appliances, we unplugged them to be sure that they didn't consume any standby electricity. We also decided to turn off our gadgets even if it was stored energy. So we turned off our celphones and laptops and just took a few pictures from our digicam to document and remember Earth Hour. Sadly though, we were the only ones in our street who had our lights totally off. 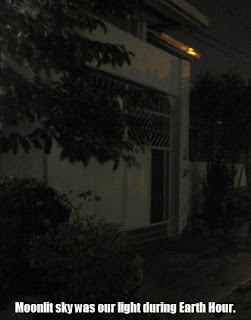 It seemed that our neighbors were either ignorant of Earth Hour or didn't care to support it. They may have mistaken us for not being at home. 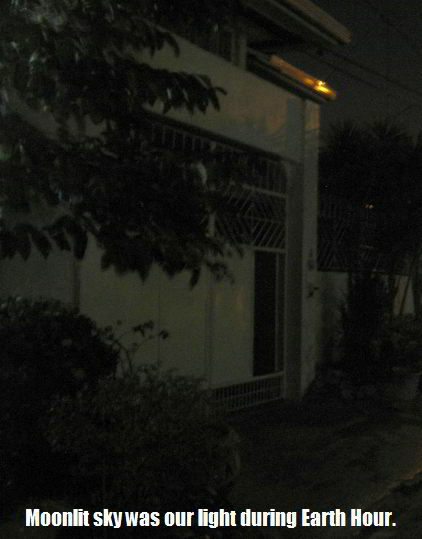 Around 9:40pm, we decided to end Earth Hour and went inside the house. We know that it's only one hour long, but it also is a reminder to make an effort to conserve energy. It's not a matter of whether you can afford it or not. It's the mindset that electricity requires resources, and the earth, as big as it is, doesn't have unlimited resources for mankind. Thus, we could show our concern by doing our part as citizens of mother earth. Earth Hour is not just about turning off the lights for one hour once a year. It's a conscious commitment to care for the world we live in.